Historian William Anderson provides Little House fans an enjoyable account in Laura Ingalls Wilder: A Biography (affiliate link). 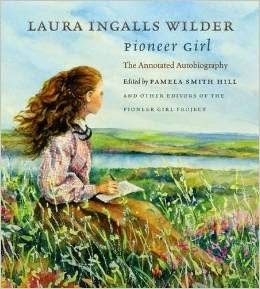 Not only does he tell of Laura’s life, he also helps the reader understand the larger context of American pioneering during the nineteenth century. Mr. Anderson begins the book explaining the Homestead Act of 1862 and how it provided the opportunity for Americans to work and, if successful, to own land in the woods or plains without purchasing the land. Then he continues the book by sharing of the life of a beloved author. Mr. Anderson chronicles the familiar story of Laura Ingalls Wilder’s years growing up in various locations, as well as her adult life with her husband Almanzo and daughter Rose. 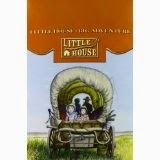 In addition to summarizing her life, he also explains some details excluded from the Little House books. In addition to Mary, Laura, Carrie, and Grace, the Ingalls family also had a son. Charles Frederic was born in 1875 and died about nine months later. The Ingall family spent a year working as hotel keepers in the town of Burr Oak, Iowa. These difficult trials, and others, were not mentioned in the Little House books. Mr. Anderson also tells of Laura’s adult life. Though readers tend to think of her as a little girl, she lived to be lived to be 90 years old, dying just three days after her birthday. 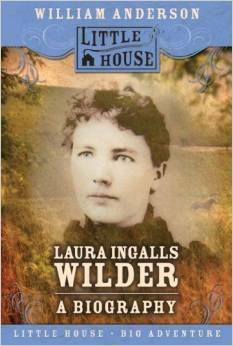 Laura Ingalls Wilder: A Biography gives Little House fans new insight about one of their favorite authors. It also includes a nice selection of photographs from Laura’s life. Though written for 8-12 year olds, fans of all ages will enjoy this biography. I definitely recommend it. This post contains Amazon affiliate links. If you make any purchases through the Amazon links, I will earn a tiny percentage at no additional cost to you. Thanks for your support!